One study, conducted by the American Osteopathic Association, found that exercising with the people around you will decrease stress levels by 26 percent and “significantly improves quality of life.” When people exercise at work and train as a team, they see 12.6 percent improvements in mental health, 24.8 percent improvements in physical health, and 26 percent improvements in emotional health. In that study, they also found that people who work out on their own don’t experience those benefits to such a degree. Their quality of life and stress levels didn’t change as much when they exercised alone as it did when they exercised at work with buddies. Having team goals, encouraging each other, and facing something difficult together is amazing for communally beating stress. 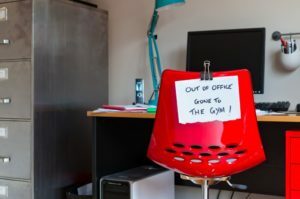 A British study of 200 university and life insurance company employees found that when people exercise at work, they are more productive, less fatigued, more patient, and more tolerant toward their coworkers. This was the case regardless of whether the employees participated in yoga, strength training, aerobic activities or pickup basketball. A University of Southern California study found that when people exercise at work, they liked what they were doing more. In fact, they not only liked their exercises more, but they also found their jobs to be more fun as a whole. Overall, they liked what they were doing more than they did without the exercise. When teams of employees exercise at work, they experience overall health benefits. This includes mental, physical and emotional health. As a result, they were less likely to fall ill. This includes fewer days spent ill at work in which productivity would be reduced. It also decreased the number of sick days workers needed to take away from the job in order to heal up and recover.